This is a perennial grass, with fine leaves and very attractive purple flower heads. It grows to less than 3' in height. 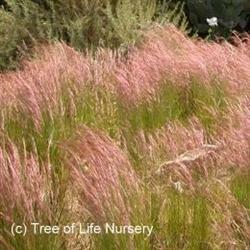 It is a grass lovers dream grass, small clumps of green stems with purple haze of flowerheads atop. Planting en masse produces stunning purple show in the warm season, or artfully placed small clumps will add some color to a summer garden.